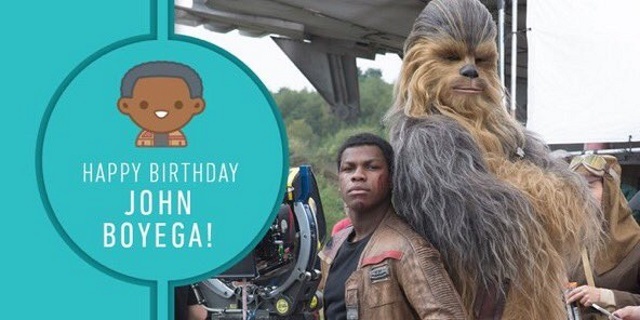 Revengeofthe5th.net: Happy Birthday John Boyega! Happy birthday to Finn himself, John Boyega, born on March 17, 1992! Born John Adedayo B. Adegboyega, the actor made a name for himself in the lead role of Moses in the fantastic British sci-fi comedy Attack the Block, released in 2011. He appeared in "24: Live Another Day," the 2014 Jack Bauer/Fox mini series, and hit superstardom when he was chosen for the role of Finn, the rogue Stormtrooper, in 2015's Star Wars: The Force Awakens. Boyega reprised the role of Finn in 2017's Star Wars: The Last Jedi, and also appeared in the historical drama Detroit that same year. In 2018, he appeared in another sci-fi franchise, with a lead role in Pacific Rim: Uprising. He also lent his voice to Netflix's recent animated series, "Watership Down," and to the animated Star Wars series "Forces of Destiny." He recently completed work, of course, on Star Wars: Episode IX. He received the BAFTA Rising Star Award in 2016. All the best to John Boyega!